Welcome to the third article in the series on budget rally trapping. If you missed either of the preceding articles, you can find them here. This particular article is pretty much independent of power or anything else. 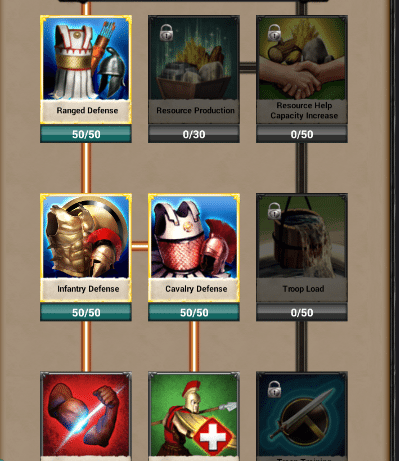 It’s the hero skill set up I use, and it’s what I’d suggest to anyone that doesn’t run a biased, one troop type rally trap set up. Overall troop boosts and debuffs are most important, though these boosts are more vulnerable to debuffs from the enemy rally leader’s cores. Your opponent will likely have missile cores, that massively boost one type of troop attack (infantry, ranged, or cavalry), and have considerable overall troop attack, troop health, and troop defense values. Custom core sets enemy rally leaders can be wearing vary widely in strength, though some are comparable or better than the set gear cores. The max attack values (combined troop type and overall troop attack) you can be hit with are around 5700%, but the effectiveness of the enemy’s cores can be enhanced considerably by debuffs, as can yours. There may be some considerable variability in results between two different rallies led by different leaders wearing what look like identical core sets with level 60 heroes. The fact is that not everyone knows what they’re doing, no matter how much money they spend on the game. Some rally leaders don’t know how to gem correctly, or don’t skill right. Occasionally, even the most experienced will forget to pop their cores in time and you’ll get hit in their defense gear. Expect some variation. You may have no problem eating a Poseidon rally led by a level 60 hero from alliance A, but you may lose handily in the next rally from alliance B, also led by a level 60 hero wearing Poseidon cores. 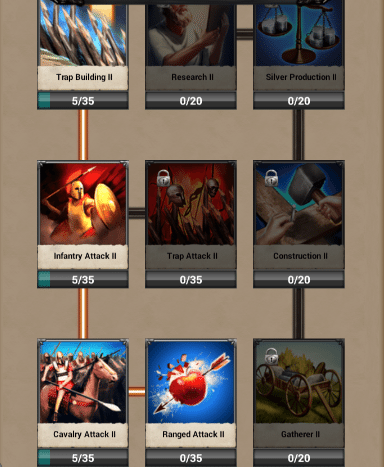 When allocating hero skills points for your preset(s) and your permanent gear, you’d think you want to focus on the most powerful boosts, that have been previously covered here on Insidegameofwar.com. However, the combat boosts for rally traps are ranked a bit different than what we’d normally consider to be the most important boosts. Troop Defense and Enemy Troop Attack Debuff, and overall Troop Health to a lesser extent, are the most powerful boosts when defending against rallies as a prototypical T2/T4 trap. If you run a T3/T4 trap, then health is a bit more important for you since you’ll have a smaller troop count. But in general, overall Troop Defense and Enemy Troop Attack Debuff are the most powerful boost and debuff, respectively, when defending against rallies with large troop numbers, like one is with a T2/T4 rally trap. Large numbers being 80 million plus. After those two (or three), the three individual troop type defenses – Infantry Defense, Ranged Defense, and Cavalry Defense are extremely important. These are a bit harder to debuff, though with the release of the Wild tree and better cores, it can definitely still be done. Nike cores for example, debuff more troop type defense than previous core sets. 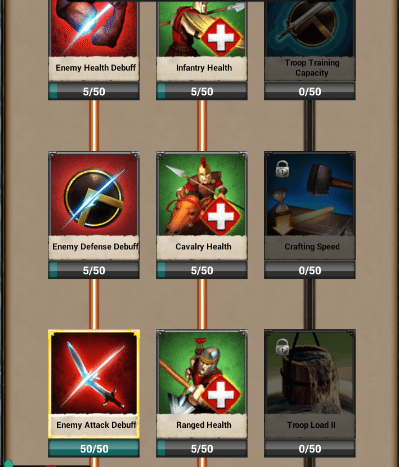 Health Debuff on enemy cores can be over 1600%, so it’s very difficult to ever have enough Troop Health nowadays. 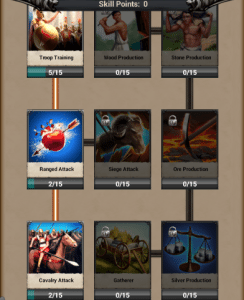 As harped on above, with a T2/T4 rally trap, the most critical boosts are overall Troop Defense, and then arguably the three troop type defenses, and overall Troop Health. With Poseidon and Ares, it’s becoming sort of a moot point, as rally leaders with full Lv.23 buildings and research can have up over 1650% Enemy Troop Health Debuff.. so I’m more concerned with the troop type defenses these days. I set up my permanent defense gear skills and core defense skills as shown below. I fill Troop Attack, Troop Health I, Troop Defense I, Troop Defense II, Troop Health II, Infantry/Ranged/Cavalry Defense, Enemy Attack Debuff, Altar Bonus Health, Altar Bonus Defense, and most of Alter Bonus Attack. I have a Lv.60 hero on my rally trap, so if you have fewer skill points available, I’d reduce points in Altar Boost Attack, and a few off each troop type defense, or Troop Health II. I will say this once and use bold for emphasis: altar boost defense, altar boost health, and altar boost attack (to a lesser extent than the first two) are the most important hero skills to fill at hero level 55 and above. If you are able to kill the entire rally due to sheer mass of troops with very little attack, then Altar Boost Attack is the least important of the three for you. Anyway, these boosts DO NOT require an altar to be present in your city (I don’t have one on my rally trap) or an active altar boost to receive their benefits. 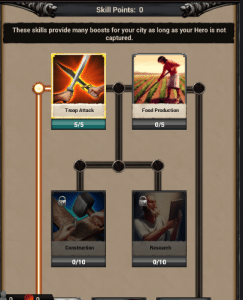 They will improve ALL of your combat boosts proportionally based on your research and city’s building make up, simply by being skilled. FYI, they will only show up when looking at a preset if the current preset you have equipped has them skilled. Also, they also will increase the boosts awarded by the altar itself if you execute a hero. The above screenshots are for a general defensive preset.. you also can set up different presets for each troop type, but this is rather tedious unless you have a good bit of time before a rally is going to land. By this I mean, if you want to have a preset for defending against Cavalry (Frostbitten/Ares, customs, etc. ), then you would skill Ranged Defense and Ranged Health, for example. 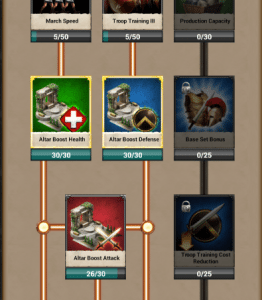 If you want to do missile troop specific defense presets, then you need to skill both the troop type defense and health of the weakest troop type against the incoming troop type. 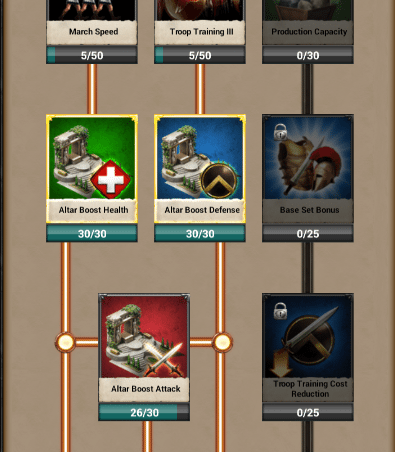 Overall Troop Defense I & II, overall Troop Health I & II, and the Altar Bonus Boosts should still be skilled like normal, regardless of how you set up each preset. The permanent gear article will be updated in a few days, and the defensive cores article a few days after that. For the other articles in the series, see here. Lubears, I would like to see your suggestions for those of us that are still below sh21 and don’t have the presets or T4s. Can you be a trap with T2/T3? I have hero 61 and frostlord gear. Also is there a nerf for this ratio. Is there any truth to some sort of “Hidden Boost” with you have the 90 points allocated to the 3 alter skills? I’d only recommend doing this if you’ve completed the full set bonus tree, and have a full set of top-end defensive gear, and so many troops you don’t use any kunais… which generally rally traps don’t have. On my bigger account I did so for Imperial Dragon and Frostlord, but I don’t think I have for Golden Shogun. I can look. You have to set the skill points in the preset list, not on your actual hero. The preset setup page is a tab on the right side of your hero view, below the accessory on the right side. Why does the skill points reset every time you change your presets? They don’t. Or shouldn’t be. You have to fill in the skill points in the actual preset, not where you normally would. Filling in points on the normal skill point tab just skills your hero while you’ve equipped that preset, but doesn’t change how the preset is set up. I have a question, I just hit hero level 60. The level 21 gymnos gives a 20 point hero skill point boost. I reset skills on some presets according to cores loaded. Will I lose the 20 point bonus if I destroy my gymnos and reset hero skills on a preset? I would love to replace it with a hospital or barracks, but don’t want to lose the bonus points. You will only lose the bonus points from your monster skills, NOT the hero skills. Good articles. Just a heads up that you cant make a budget rally trap on 2x 100 USD packs. I run a small 3bn rally trap and wanted to make one for my brother. 2 packs doesn’t give you enough items to make defensive permament sets or muvh in the way of cores. With the way pack inflation is going 2 packs might be possible in 6 months but not now. I am at 6 packs for his account and that is still not enough I reckon 8-12 packs more realsitic for a 2bn rally trap. It shouldn’t cost that much. I’m not sure how you’re going about doing it, but I recently made another one (2.8b power) and it cost $270 on top of the $170 total I’d spent to get the account to where it was at that point (300m power). I use regular gear, which I made from the mats I got from that $270 total. “Cheap” by definition is the cost of something based on its perceived value. Making a rally trap is not literally cheap, or cheap in an absolute sense. $440 is still a lot of money to most people, me included. But it costs vastly less than what others have spent to lead the rallies that you eat, and leading/eating rallies is perceived as one of the most valuable things in Game of War. Let’s say a rally leader spent $100,000; I spent 0.044% as much as he did and I can eat his rally. For the results I got compared to how much I spent, that’s cheap (or replace cheap with bargain, if you like). And that’s what it meant when I was writing the articles. Not cheap in an absolute sense, but cheap in a comparative sense. If you have a lower troop count and have trouble killing the whole rally, I’d recommend Attack and Attack Debuff. If you have no problem at all killing the whole rally, I’d recommend Defense and Attack Debuff. But really, you can’t go wrong using Defense and Attack Debuff as those two will reduce your losses the most. I agree, and I personally use 3 different core presets to counteract this waste of attack power. However, what I said still stands – there is a horizon where at a certain troop count, attack becomes better than defense health debuff. The only problem is no one knows exactly where it is – and every time the max rally size goes up it changes. Another consideration is what you’re trying to use efficiently. No matter how you look at it, you have to sacrifice something. Higher power to get more presets, lower power for less effective core suits, more money for better cores. 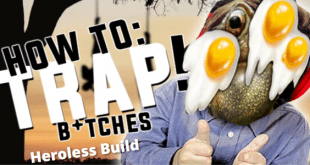 That’s what I love about rally trapping – you have enough possibility that people can do wildly different things and still succeed, but eventually there is limits that have to be worked around and everyone finds a different way. I redid my hero skills like you pointed out & it didn’t change my boost % at all. Any suggestions? Maybe I did something wrong! The game just kicked it’s imminent demise into high gear if this is a permanent reduction… and I would hate to be the guy taking a rally right when that happened… thinking he had all those beds only to find out he just lost all those troops… have fun trappers!!!! Great info! Thank you, we are ready for the next article now. Hoping to see a article covering gear soon! I usually eat and cap every rally except for a frost rally. So I skill my basic defense regular gear the way you have suggested. However for a frost rally since I know the incoming troop type is cav, it’s actually better for me to skill to max out inf att and range defense. This combined with cores that max inf attack allow me to eat and cap even frost rallies. So I have one preset with even boosts for every rally other than frost and one preset for cores and skilled for frost maximizing inf att and range defense. I find that also if it’s an odin or orion rally that since these have such high defense that in order for me to cap, I need to reduce a little bit of defense and add in some extra troop attack so instead of using all haunted xena/frostlord I will add in one piece of colossus or samarai for extra attack and I usually cap even odin and orion. So based on attackers cores you might need to tweak your stats a bit to make sure you cap each time. I think you’re wrong to focus entirely on troop, rather than individual type (infantry, ranged, cav) boosts and debuffs, both in your skills and as you build cores…especially skipping the attack boosts for these troops. I don’t want to get too far off track, since this is focused on defending, and specifically stats and skills. But let’s pretend you’re about to get hit with an Orion set, which has a large amount of troop attack debuff built in. If you focus on troop attack, that attack will get reduced by the TROOP attack debuff on the Orion. 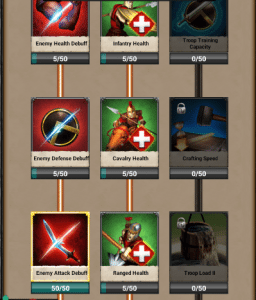 However, your infantry, ranged, and cav specific attack bonuses won’t be touched by that debuff…it only works on your TROOP attack specifically. 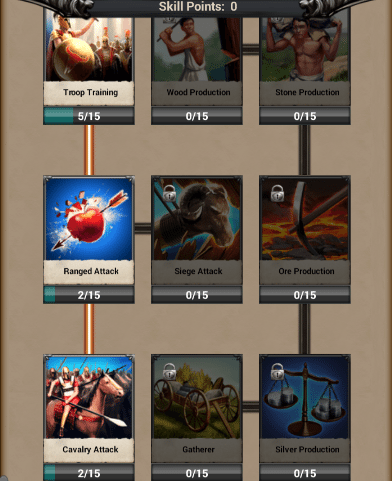 Same thing goes (even moreso) for troop defense debuff; the 84% troop defense you skilled into in your setup will get wiped out by the opponent’s troop attack debuff…but the 50% inf/ranged/cav defense you could have gotten would be untouched unless they have that specific debuff built in. That’s a good point. Most core sets have defense debuff that is really high however most do not have individual troop defense debuff so having inf / range / cav defense specifically might be better cuz it is harder to debuff. FYI, the 84% defense I skill doesn’t exist in a vacuum (and it isn’t debuffed by enemy attack debuff, nor can it be debuffed all the way to zero). Research, altar bonus boosts, barracks, etc. equates to 708.5% overall troop defense without any gear. 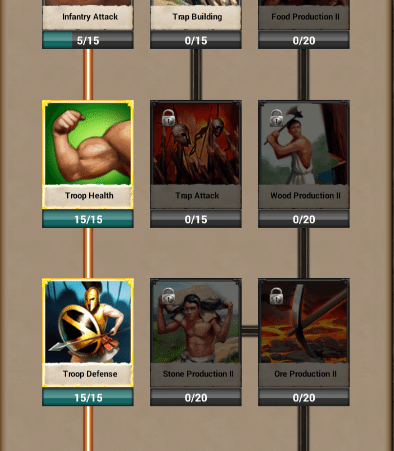 To add 47% more individual troop type defense, my overall defense would drop to 611.5% and my overall troop health would fall to 651% from 748% because of the extra hero points I would need (that were used to fill Troop Health I & II). So close to 100% less of both health and defense for a gain of 47% inf/rang/cav defense. That’s a huge waste imo. To fill all the troop type attacks I & II (~65% gain in each troop type attack), it will cost me all but 5 points in each debuff, and overall attack would drop as well because I wouldn’t be able to fill altar attack bonus all the way as a result. It’s a very poor use of skill points, and definitely not the best value for each point. I add individual boosts in my cores, but don’t waste the attribute points when skilling my hero. But if that math works for you, go for it. I certainly wouldn’t recommend it as standard practice for taking a rally. Cores? Who needs cores, Frostlords with a few haunted pieces you can easily exceed 3,100% Defense and 300% individual troop attack. Using gems or putting points in overall attack it’s worthless. Most new cores can debuff almost 1K overall attack from the defender. All you got left is individual attack. Lubears, the defense debuff that comes from rally leaders’ gear debuffs only defense boost that comes from my gear, or also defense boost from hero skills and research and barracks? 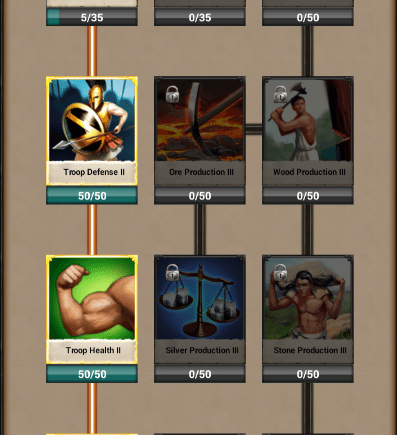 Overall troop defense. So that includes hero skills, barracks, research, gear, gems, etc. Individual troop defenses aren’t included in that unless your opponent’s cores have that troop type defense debuff built into the cores specifically. I have 5 mil t4 strat and reg each type. and 2 million t3 strat and reg each type, for 42 mil total troops. should I train 3 mil t3 each type or build 1 mil t4 each? I’d say it depends on your overall power and play style. Post some more specific info and I’ll be able to give you a more informed opinion. Thank you so much for this series of guides. So much good info. Keep it up! I look forward to every guide you write. Just curious, why defence debuff? This is a boost that comes in handy when attacking multi billion troops, but Is it that effective on taking hits from 3 mill troops? Just seems like a waste of allocated points. Can you comment your reasoning please? The reasoning is simply because it’s an overall debuff and will make killing the incoming rally a bit easier. An extra 40 points (I have 45 in it at hero level 59, and 5 is the minimum) in an individual troop boost would probably be prudent when allocated to the counter troop type in a preset using missile cores to defend, but short of that, I don’t know of any other option that will have as much of an impact. 11 or 12 points in each troop defense? I don’t think that will make much of a difference. I’ve found anything that dampens the incoming rally is a good idea. I feel least strongly about defense debuff, so if you’ve got a suggestion, by all means, please let us know. But it works for me. I posted a few things about this below, as well. This is wrong. Good luck killing the whole rally against frostbitten/Orion/Dragonbone/Odin with those skill points. Yeah, could be.. except I don’t have any problem eating rallies. I’m sharing the stuff that works for me, or that I know works for others. It’s not like I’m making this up as I go. Instead of using 150 points on individual troop defenses or health that add what ends up being the equivalent of about 50% defense/health, I use the points on things that affect all troops, both mine and the attacker’s. I can make up that 50% defense in gems easily, but would be really hard-pressed to make up that 141% (47% x 3, with 5/50 points in the three debuffs) combined enemy att/def/health debuff in gems without adversely affecting my own att/def/health. The huge boosts and debuffs in cores now mean the debuffs are that much more helpful in both dampening the blow of the rally and killing it. If you disagree, feel free to say why and what works for you instead. That’s directed at the OP, MoMoney. Thank you for sharing your input. I sort of covered my reasoning a few comments below. 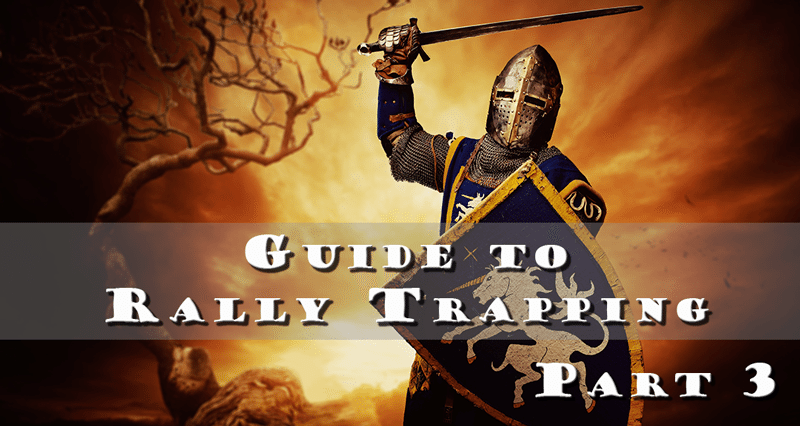 Thanks for the great articles Lubears, it’s good to see more on rally traps. When I was building mine I had to do it literally from scratch! I do disagree with putting the stat points in defense and health debuff though. I would rather put it in the troop specific attack. Consider 3 million t4 vs. 15 million t4. It costs 100 stat points for 50% health and defense, and 105 stat points for a 54% troop attack bonus (if you put the 35 into each troop attack bonus). But that 54% attack boost affects 15 million troops, whereas the health and defense debuff only affects 3 million. It’s hard to say where that event horizon is where attack becomes more beneficial than health or defense debuff, but it isn’t that high. I have had much better results focusing on attack over health / defense debuff. The premise of adding the extra attack assumes you need it though. I don’t really need more attack as I nearly always kill the entire rally. I ate one in my permanent gear last night, actually. Health debuff makes the rally considerably easier to kill regardless of the troop type in my experience. I will say, I feel least strongly about defense debuff, but it’s still an overall boost and I always prefer those since it affects the entire incoming rally, no matter what they send or what cores they are using. If you’re concerned about 50% more troop specific attack, that’s pretty easy to make up in your cores. The argument itself certainly isn’t lost on me; I do obviously understand that as a rally trap, we are sporting a clear numerical advantage, and boosting our troops would make more sense, since there are more of them. But rallies led by a level 60 hero wearing missile cores (set or custom, doesn’t matter much), hit SO much harder now than ever before (some of this is the level 60 hero skill boosts, the extra research they have, possibly gems, the Wild troops, and having VIP 16 or 17). So debuffing a rally of what could be 4400%+ combined attack with health and defense that can be around 2000%, and debuffs that can all be near or above 1000% (just off-hand, cores of rally leaders vary considerably) has worked well for me. I can see a noticeable difference in results when my attack debuff and health debuff are lower. You get more bang for your buck, so to speak with overall boosts/debuffs in my opinion. This is why my recommendations are the way they are, but I do appreciate you sharing what you do differently, and for doing it in a friendly way. If I see enough evidence that proves I should be doing otherwise, I’ll edit the article to reflect that. Except that, like with using type-specific gems in regular defense gear, at least one third of type-specific attack boosts are wasted on pretty much every hit you’ll take. If someone sends a cav missile for example, the 50 hero points you have in ranged attack I & II are basically doing nothing. Factoring that, surely the debuffs are a better choice? On the health/defense topic — I prefer a balanced approach with the thought being that the missiles that typically attack debuff one or the other but not both. So, am I understanding this correctly? 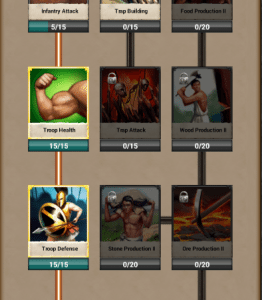 You do NOT have to execute a hero or even have an alter built to benefit from the alter boost found in the hero skill tree. Or do you still have to kill a hero to get the boosts from the hero skill tree? The author is talking about the ‘hidden combat boosts’ that wasn’t openly made known to the public before by MZ, basically a ‘bug’ in the game. but its a open secret now that more and more people already figure it out. basically 30/30/30 on altar skills, and you receive these ‘hidden boost’ without needing to have an altar present or have it activated. but to answer your specific question, you need to kill a hero to receive that extra 68% boost from the altar itself, but not significantly alot, compared to the hidden boosts. The bonuses don’t show up on the boost screen. How do you know you are getting the boost from alter talents without executed heroes? It shows up in your overall defense, health and attack numbers (found by clicking your ‘Power’ number while in your city, then ‘Boosts’). It is also based on your building setup + research, so if you have more hospitals and/or health researched, your hidden altar boost will be better for health. If you are running mostly barracks and/or defense research, your hidden altar boost will be mainly defense. You still get all 3 numbers boosted nicely but one number will usually be higher.